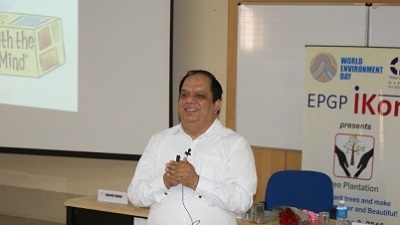 On the upcoming occasion of World Environment Day (June 5), the Corporate Interaction Committee of Executive Post Graduate Programme in Management (EPGP) at IIM Indore inaugurated the EPGP iKon: A CXO Guest Talk Series on June 3, 2016. The series is an initiative by the EPGP Participants to create a platform where corporates from various industries can interact with the students and share their views. 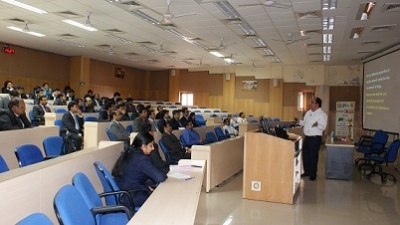 The first lecture in this series was marked by the presence of Mr. Vijay Sethi, Chief Information Officer and Head CSR, Hero MotoCorp Ltd. Mr. Sethi spoke on the topic ‘Commencing Your Journey to Become a Better Professional’. 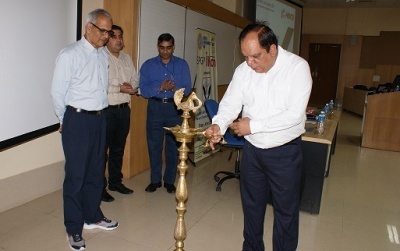 The talk commenced with the formal lamp lighting ceremony by the guest, along with Professor Prashant Salwan, Chair, EPGP, Professor Ganesh Kumar Nidugala, Dean (Academic) and Professor Madhukar Dayal, Faculty, IIM Indore. Mr. Vijay Sethi began his talk in an interactive manner, questioning the participants their purpose of joining a particular course in a B-School. The real essence of pursuing MBA from any B-School is that it helps you to change your perspective and look at things in a broader manner. Mentioning the famous lines by renowned poet Robert Frost in his poem- ‘The Road Not Taken’—‘Two roads diverged in a wood, and I—I took the one less traveled by, And that has made all the difference’, Mr. Sethi said that the course would never be easy to complete, but the efforts make all the difference. Mr. Sethi’s talk focused on the seven points noted by Stephen Covey’s book-‘7 Habits of Highly Effective People’, wherein he discussed how a person can be successful. He noted that to achieve real excellence in this world, we need to start observing ourselves, look at our own shortcomings and then analyze the world around us. ‘This will help you eradicate 99% of your negativity and you will become a highly positive person’, he noted. Be Proactive- Think and react, don’t just react instantly. Begin with the End in Mind- Always keep high goals and not low goals, as failing at a higher goal and feeling frustrated about it is much better than achieving a lower goal, because then you are not using your potential. Put First Things First- Always prioritize and learn time management. Understand the difference between urgent and important tasks. Think Win-Win. Think of a situation where not only ‘I win’ or ‘You Win’, but also ‘We Win’ exists. Seek First to Understand Then be Understood: Have empathy, walk in someone else’s shoes and be an attentive listener. Sharpen the saw- Focus on your core values, practice and get skilled. 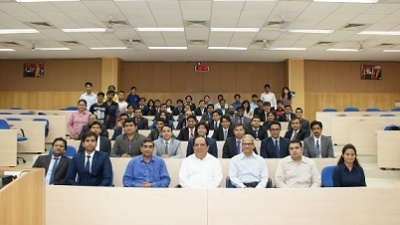 Mr. Sethi also mentioned that the two mantras for a successful life are integrity and humility. ‘A person with integrity and humble nature is not only successful, but is liked by all’, he concluded. The event concluded with a Plantation Drive at the Institute.